SuperLinxs 43dBm Outdoor Long Range 15dBi Antenna 2000mW WIFI Repeater Combo. 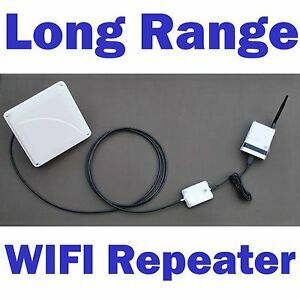 SuperLinxs 43dBm 2000mW Long Range WIFI Repeater Kits. SuperLinxs Ultra Long Range 15dBi Directional Panel Antenna with Mounts (Model #: DRP33V-M).